Baby Milk Action is sending the following letter to all political parties represented in the parliaments of the UK to ask about their infant and young child feeding policies in the run up to the General Election in 2017. What is your party’s policy on infant and young child feeding? I am writing to you as we look towards the election in 2017 for clarification on matters of interest to the Baby Feeding Law Group (BFLG). With this in mind, I would be grateful for your official response to the following questions. We would like to know if your party will party protect parents from aggressive company marketing practices and if your party will fully implement the Global Strategy for Infant and Young Child Feeding. 1. Will your party protect parents from aggressive marketing by baby feeding companies? Monitoring evidence gathered for BFLG shows that formula and feeding bottle companies and retailers aggressively market their products to profiteer from parents that use infant formula and other breastmilk substitutes. They also aim to expand their market by undermining breastfeeding. The World Health Assembly calls for an end to promotional claims on foods for infants and young children because they generally mislead parents and undermine independent information from health workers, mother support groups and expert sources such as NHS Choices. For example, products such as follow-on formula and milks for older babies are promoted with the suggestion they are needed to provide important nutrients, but NHS Choices and the World Health Organisation are clear that these are unnecessary products. Babies can be fed on infant formula for the first 12 months if they are not breastfed and thereafter can be fed with the same milk as the rest of the family. Formula companies promote specialised formulas even though NHS Choices says there is no evidence of benefits for some of these. One company sells exactly the same powdered formula under different brand names, charging more for one as a premium brand. Most parents are unaware how they are being exploited. The Advertising Standards Authority has upheld complaints about claims made for formulas and feeding bottles, showing that companies are not reliable sources of information. Independent sources of information are available. The International Code of Marketing of Breastmilk Substitutes and subsequent, relevant WHA Resolutions aim to ensure that these products are marketed responsibly. Although the UK has supported these measures at the World Health Assembly they have still not been fully implemented in UK legislation. In the past, our membership of the European Union has been used as an excuse against action, even though other EU Member States have gone further than the UK to protect parents. The United Nations Committee on the Rights of the Child has called three times for the UK to fully implement these measures (in 2002, 2008 and 2016). 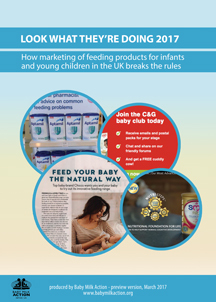 Fully details of the changes required to UK legislation to bring it into line with the International Code and Resolutions are contained in the introduction to the Look What They’re Doing in the UK 2017 monitoring report, which profiles the major formula and feeding bottle companies and retailers. Will your party pledge to fully implement the International Code and Resolutions? 2. Will your party fully implement the Global Strategy for Infant and Young Child Feeding in the UK? The UK supported the adoption of the Global Strategy for Infant and Young Child Feeding at the World Health Assembly (WHA) in 2002 and has renewed this support repeatedly at subsequent Assemblies. The majority of mothers in the UK say they wanted to breastfeed for longer than they did. The policies required to support mothers to breastfeed for as long as they wish are well known and set out in the Global Strategy. 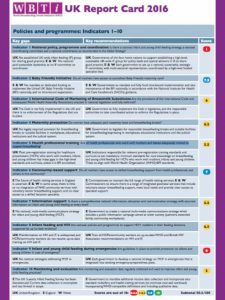 The World Breastfeeding Trends initiative (WBTi) assesses countries on their progress in implementing 10 key policy areas set out in the Global Strategy. While there has been some progress, the overall score for the UK puts it towards the bottom of the table comparing countries assessed so far (of 84 countries assessed by 2016, the UK sits at position 66 with a score of 50.5 out of 100). It is hardly surprising, therefore, that the Lancet Breastfeeding Series reported in January 2016 that the UK has the worst breastfeeding rate in the world. The National Infant Feeding Survey due in 2015 was scrapped. Gathering such data is one of the areas where action is required. The report cards for each of the four countries that make up the UK (England, Northern Ireland, Scotland and Wales) and the UK as a whole summarise what action is needed and provide a score to show how far short we are currently falling. National Policy, Programme and Coordination. Implementation of the International Code of Marketing of Breastmilk Substitutes. Maternity Protection in the Workplace. Health and Nutrition Care System (in support of breastfeeding and infant and young child feeding). Mother Support and Community Outreach. Mechanisms of Monitoring and Evaluating Systems. Will your party fully implement the Global Strategy for Infant and Young Child Feeding in the UK, thereby supporting mothers to breastfeed for as long as they wish and improving the UK’s score in the next WBTi assessment?